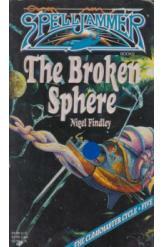 The Broken Sphere by Nigel Findley, Sci Fi. Book is in good condition, all pages intact. Using the remote sensing abilities granted by his magic amulet, Teldin Moore journeys across wild space in pursuit of the legendary ship Spelljammer. His search leads him to the Broken Sphere, where enemies descend upon him to steal his control cloak and use the Spelljammer for their own purposes. Part of the Spelljammer: Cloakmaster Cycle series.